(WEST, Texas)—Texas Farm Bureau (TFB) members have donated $173,100 to help restore the community of West following the fertilizer plant explosion. Representatives gathered July 25 at the West firehouse to present the funds on behalf of TFB, the Texas Farm Bureau Insurance Companies (TFBIC), county Farm Bureaus and TFB members. “Throughout Farm Bureau in Texas, our hearts and prayers have been with the citizens of West ever since the tragedy this past April. Immediately following the explosion, Farm Bureau members across the state asked that we put together an effort to raise funds to help the citizens of West. We are here today to present the results of that effort,” said TFB President Kenneth Dierschke. Dierschke presented two checks to West city mayor and EMS officials. The state’s largest farming and ranching organization presented $125,000 to help fund a new ambulance for West EMS. A second donation of $48,100 was given for a park to be named in honor of the first responders who sacrificed for their neighbors and their community. More than 400 TFB member families live in West. TFB has nearly 500,000 member families in Texas and more than 4,000 in McLennan County. On Monday, the board of directors for TFB and TFBIC approved donations to complement the gifts of dozens of county Farm Bureau organizations and many members across the state. Texas Farm Bureau (TFB) President Kenneth Dierschke presents a check on behalf of TFB members for $125,000 to West EMS to help fund a new ambulance following the devastating fertilizer plant explosion in April. TFB also donated an additional $48,100 to restore a park in memory of the first responders. 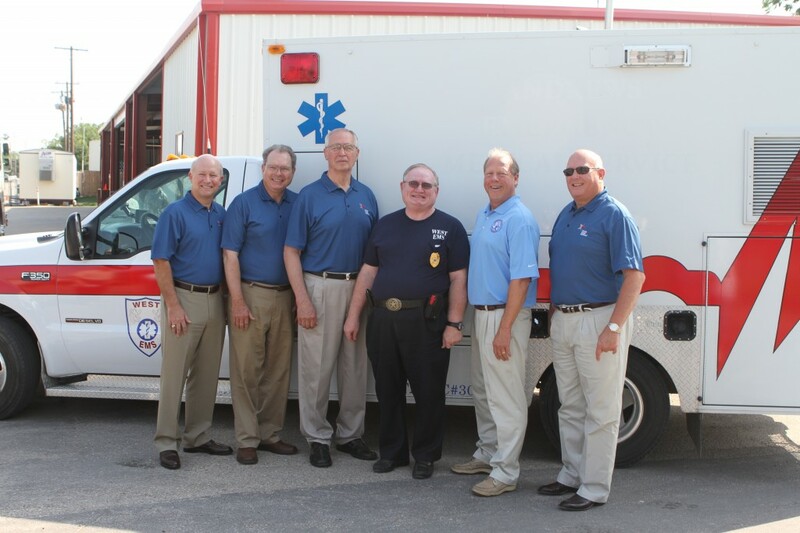 Pictured (left to right): Mike Gerik, executive vice president, Texas Farm Bureau Insurance Companies; Neil Walter, District 8 state director, TFB; Dierschke; Dr. George Smith, director, West EMS; West Mayor Tommy Muska; and Vernie Glasson, executive director and COO, TFB.